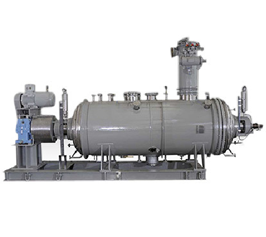 Rotary vacuum paddle dryer is a jacketed cylindrical vessel with a large diameter hollow shaft. Attached to the shaft are hollow paddles provided with specially designed scraper blades, which scrape the entire internal surface of the dryer and continuously move and rotate the material thereby precluding the possibility of material remaining in contact with hot surfaces for protracted periods of time. The jacket and hollow shaft with paddles can be heated with hot water, steam or any other thermal fluid capable of providing a large indirect heat transfer area. Cooling can be also be done by cold water, brine or any other refrigerant through the jacket and hollow shaft. Slurry/wet cake is charged through the charging door while keeping rotation of the agitator on. Vacuum is then applied to the dryer along with dust catcher (mounted on the dryer) condenser and receiver. Heating medium is passed through the jacket and agitator. Vigorous evaporation of moisture take place under vacuum. The vapor passes through the bag filters of the dust catcher, goes into the condenser and the condensate is collected in the receiver. Evaporation under high vacuum and low temperature results in faster recovery of maximum solvents. Adequate provision has been provided to cater for fluctuations in steam pressure / temperature, in condenser cooling water temperature, moisture content of feed etc. Dry product is discharged via the discharge valve by the reversing the agitator rotational direction to "discharge" direction. Ideal for temperature sensitive materials. Almost 100 per cent recovery of solvents. Gross capacity: from 500 ltrs. To 5000 ltrs. Charging capacity: 40 to 60% of gross capacity depending on the nature of the products.